My last blogpost was merely an announcement of Microsoft’s announcement about Microsoft Dynamics 365 Business Central. We are a 24 hours later now, so let’s share some more information about this new release of NAV-In-The-Cloud. I assembled this myself, from blogs, documents, slides, talks and mails – so there is a disclaimer for sure 🙂 (below the mail). With quite a sense of sarcasme .. we all “loved” the previous name, right? “Microsoft Dynamics 365 for Finance and Operation, Business Edition” – or short: MS365fFaOBE, or shorter MS365FOBE. The one that came up with that name .. well .. I want to try what he took that day ;-). It was a bad name. I noticed because I had to explain time and time again the same things to the same people: no, it’s not only Finance, you can do more… . In any case – glad we got rid of that! “Microsoft Dynamics 365 Business Central” is a strong name, all inclusive .. you nailed it! Make no mistake. This release comes with the full NAV capabilities. Full? Yes? All? Yes! With Manufacturing? Yes! As Microsoft puts it: “It is an all-in-one business management solution that helps organizations streamline business processes, improve customer interactions and enable growth“. Business without silos (:-)): basically being able to enhance/boost/connect your Dynamics 365 tenant by enabling workflows, or automated tasks by your familiar (Office) tools. I’m guessing Flow, Outlook, … . ;-). Actionable insights: That’s data, right? Business Intelligence? PowerBI! Basically, connect again the familiar tools with your data to gain complete business insights – and even more, enabled with (and I quote) “Microsoft’s leading intelligent technologies”. Machine Learning comes to mind ;-). Solutions built to evolve: the platform is NAV – which is simple, efficient and above all flexible! All you need to evolve beyond Business Central! I think with this pillar, Microsoft points to the great new Extensibility Model.. So, “Premium” is what I would call “the full monty” ;-). Well, there are a number of webinars scheduled in the next months. But since this is all information for partners, I’m not sure I can share it here. In any case – contact your local Microsoft contact soon to be part of all (or at least most) of these webinars! Can you tell me more about the “functional” changes on the product? Not that much yet – simply because I’m not completely informed. But let me share what I know. The app will be available on all devices: Phone, Tablet, laptop, desktop .. All with the same rich functionality – not only on Windows, but also on Android and iOS. Extended Outlook functionality brings you (and I quote): quote to cash, all within outlook. You can create quotes, based on the content of a mail .. And you can even submit invoices, all from Outlook! An In-Client visual designer to support your “unique business needs”. And, as mentioned above, you’ll be able to add apps from AppSource, again to fit your industry or business needs. And even, you will be able to create PowerApps based on all your data! 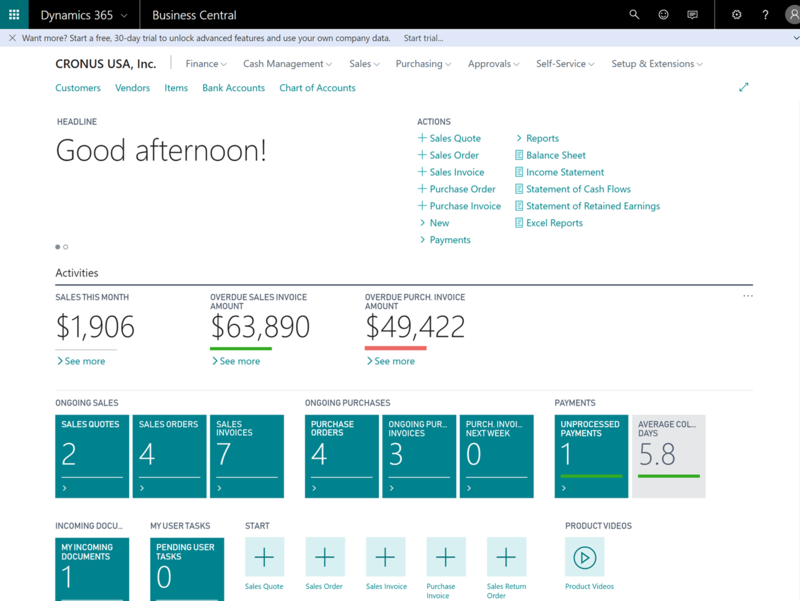 Just go to the capabilities page of Business Central, and you can watch some more screenshots there. No, I have been able to gather some more information: answers to questions that people might have. Is a Demo environment available? It is mostly work in progress – but it will be at demos.microsoft.com. In the meantime, just use your demos.microsoft.com O365 account to sign up for a free Business Central trial – then those accounts are linked. But the “decent” version will be available from April 2nd, when Business Central is generally available. You will also be able to spin up your own docker image, and have a D365 docker image running on your own PC. Obviously, a lot will not work like that (like Office365 integration and such…) – but at least you will have the look and feel. 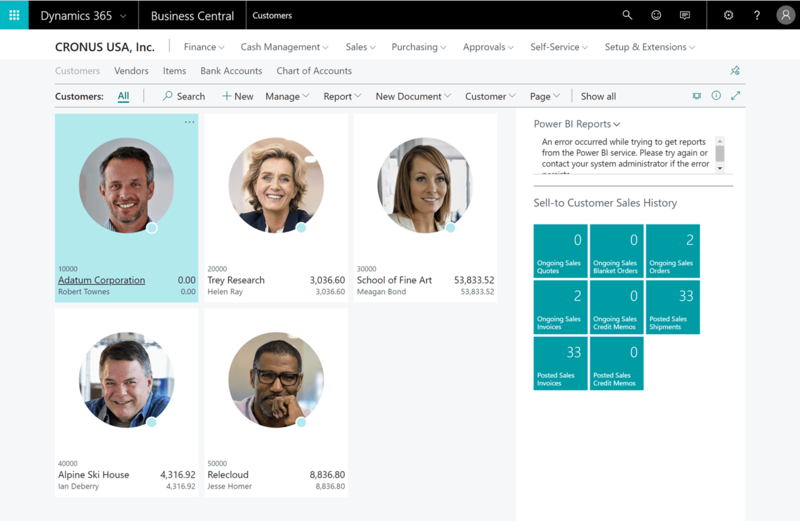 Will Dynamics 365 Business Central be available On Prem? It is currently only a cloud based solution. Dynamics NAV 2018 continues to be available as is for on premises solutions, and being updated by means of cumulative updates, like we can see what is happening for GDPR. I got that there is going to be news shortly. All I can say is: watch the roadmap here: https://roadmap.dynamics.com/ .. But be aware there are also opportunities for partner-led localizations on Business Central. Are all features going to be available on prem release? That is definitely the intent of Microsoft! They are still planning for one codebase. Will there be any migration tools to Business Central? Yes! There is already a conversion tool for QuickBooks. And more will come! There will even be transition tools for all of Microsoft’s current on prem SMB solutions, like GP and SL. Will the name “NAV” disappear/change for On Prem? Which modules of NAV are not part of Business Central? Is Business Central again a merged name for NAV and AX based solutions? Not that I know of. Business Central is the name of the online service, based on the NAV code base, previously referred to as “Tenerife”. Will we lose the Windows Client in Q4, when the On Prem release is there? The current plan of Microsoft is that we will NOT lose the Windows Client! You break down stuff like no other. Any info yet on how extensions will work without going through AppSource? Will we just be able to load them and what will this mean for object IDs and licences? Don’t know exactly what you mean, but you have the same license/object-id restrictions as you are used to. Sorry to clarify – we are a partner company. So I assume our customers will continue to purchase object IDs on their licence for any customisations they require. However what happens if I create a codeunit 50000 in my extension and this ID is already used in another extension they have installed? Maybe AppSource extensions will have their own specific ID range that won’t clash with the ID range available to partners? As I said – similar experience – you won’t be able to install the extension because there are conflicting objects.. . In AppSource, there are specific object ranges – so this shouldn’t be a problem, indeed. Excellent! Last question I promise- I’ve searched all info and blogs and haven’t seen anything mentioned about still being able to modify the standard code base in C/AL. This was mentioned at Directions EMEA last year. Have you heard anything? Well, not much to disclose just yet. I doubt you’ll be able to change C/AL (you won’t…), but you will be able to do customer-specific changes. How that will look like, I don’t know. Great thanks! Maybe we’ll find out on Thursday on the Directions webinar. I al still worried about the Date Filtering, Budget Filtering in List pages… I am trying MSDyn365bc in docker right now and its still missing… The webclient is going to be hard to use without advanced filtering. Did they talk about that today? Hi there! great post! I enjoyed reading it. good detail with some nice humor to it. I will be back for more. Hi, any idea how are they going to manage licensing for extensions objects if Customers are paying a fixed amount per user/month? If we want to extend on a customer base how will the customer pay for extension objects? As I was told: “Table extensions” and “page extensions” will not require a license .. does that answer the question?